There are a total of 5 different products in this collection, including nail polishes, lipsticks, blushers, a BB cream, and a mascara. I'll start with the BB cream first. In order for it to fit the Snow White theme, Etude House repackaged the original Etude House Precious Mineral BB Cream Blooming Fit,which they recently upgraded this summer, in white with red apples instead of their usual pink. 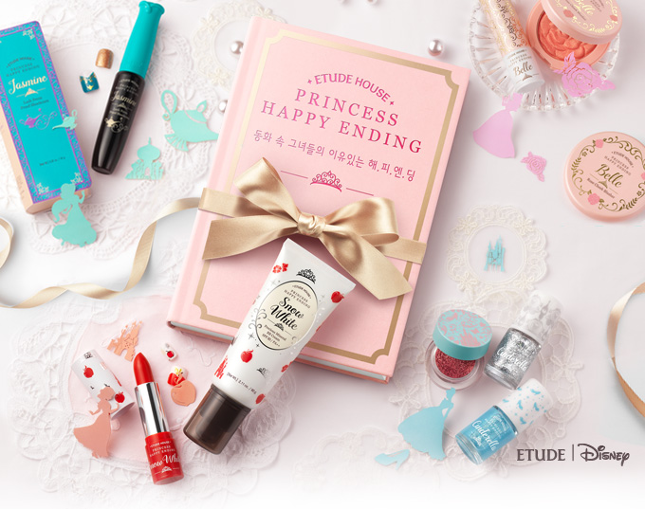 Actually, if any of you guys follow Etude House's official Facebook page, you would've seen this product used in this video here, along with the new Snow White themed lipstick. This is only available in 2 shades, N02 Light Beige and W13 Natural Beige. It seems like orchid lipsticks are a trend this year! 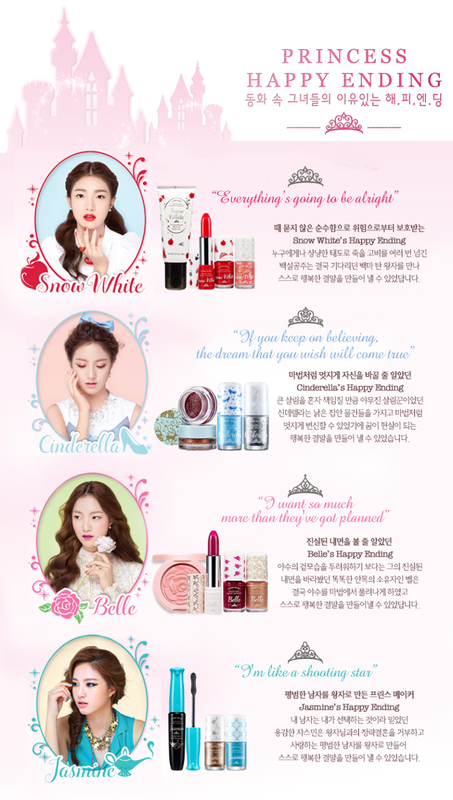 Along with a Snow White themed lipstick, Etude House also released one for Belle as well. From the promo pictures, it looks like the lipsticks will be moisturizing with a glossy finish. Isn't the packaging for the Belle lipstick really pretty? *-* I love how elegant it looks with the gold swirls on a pale pink background. Sadly the shade isn't really my color, so I'll pass on it. This is available in Apple Red, a fitting name and color for a Snow White lipstick, and Purple Rose. 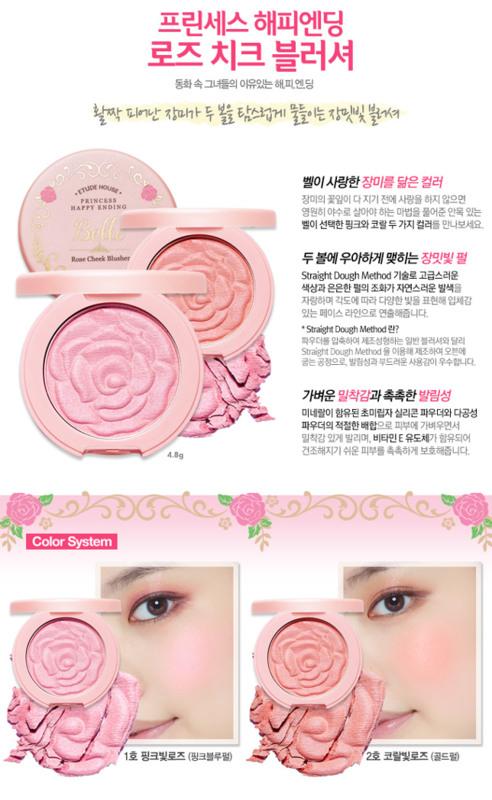 According to Etude House this uses the "straight dough method", a method in which the contents of the powder are kneaded at once and matured after being molded into different sizes. Apparently it strengthens cohesion and stability, and allows for smooth and even application. Honestly I don't really like the packaging for this very much. Plus I don't wear blush, so I won't be purchasing this. Once again, this is also available in 2 shades, Light Pink Rose and Light Coral Rose. This is again another repackaging of the original Lash Perm Proof Shockcara that Etude House released for their Lock'N Summer collection. So if you already purchased that one before, then there's absolutely no need to purchase this unless you just have to have this packaging. The box (shown in the very first photo of this post) looks better than the actual mascara tube in my opinion. lol Since I don't like mascara because it never works for me, I'll be skipping on this as well. So what do you guys think of this collection? Do you plan on purchasing anything from it? Currently there aren't any shops that are selling products from this collection yet, but I will update this post as soon as there are any! All photos above are from Etude House and were only edited by me. After following Etude for awhile, I feel like they keep releasing the same products with slightly better formulas/more benefits/different colors in different packagings so I'm not really interested in this line. Imo the Princess Happy Ending Lipstick resembles Xoxo Minnie Kissing Lips, Princess Happy Ending Lash Perm Proof Shockcara resembles the old Shockara with different wand and maybe slightly different formula and obviously the Princess Happy Ending Precious Mineral BB Cream Blooming Fit which is repackaged of the original Etude House Precious Mineral BB Cream Blooming Fit. So NAYYYYY, I'm not getting any from this line. to save money lol. Thanks for the detailed post on the new collection! You've already tried them? Wow, you got them really quickly then! Lol It's good to hear that they're vivid ^^ Do you like them? I agree, the packaging is quite cute. I really like the nail polish sets too :D Thanks for reading Marika~!